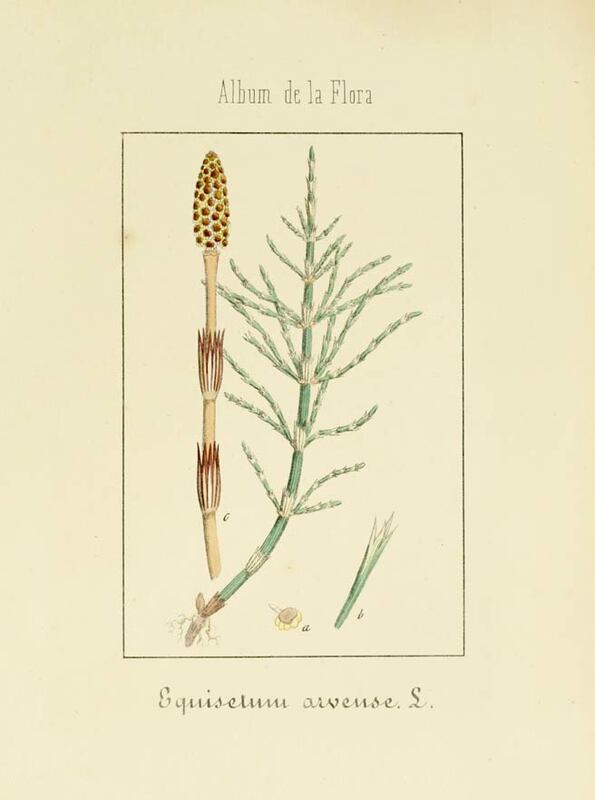 Equisetum arvense, a perennial of the Equisetaceae family, has separate sterile non-reproductive and fertile spore-bearing stems, growing from a perennial underground rhizomatous stem system. The fertile stems are produced in early spring and are non-photosynthetic, while the green sterile stems start to grow after the fertile stems have wilted, and persist through the summer until the first autumn frosts. The sterile stems are 10–90 cm tall and 3–5 mm diameter, with jointed segments around 2–5 cm long with whorls of side shoots at the segment joints; the side shoots have a diameter of about 1 mm. Some stems can have as many as 20 segments. The fertile stems are succulent-textured, off-white, 10–25 cm tall and 3–5 mm diameter, with 4–8 whorls of brown scale leaves, and an apical brown spore cone 10–40 mm long and 4–9 mm broad. The specific name arvense is derived from the Latin arvensis, meaning "from the meadow, field or grassland". The common name Scouring Rush is from the plant being used to scrub pots and pans. Equisetum arvense is an herbaceous perennial plant, native throughout the arctic and temperate regions of the northern hemisphere. Horsetail grows in open fields, waste places, roadsides in sun to part shade. Prefers a moist but well-drained fertile soil with a pH between 6.5 and 7.5. Horsetail spreads via spores—best collected as soon as they are ripe in the spring and surface-sown immediately on sterile compost. Keep moist and pot up as soon as the plants are large enough to handle. Very difficult to grow from spores. Division is an easier method of propagation for horsetail. The plants usually spread very freely when well sited and should not really need any assistance. Plants have a deep and penetrating root system and can be invasive. If grown in the garden they are best kept in bounds by planting them in a large container which can be sunk into the ground. The green infertile stems are harvested, they are most active when fresh but can also be harvested in late summer and dried for later use. Store dried cut stems in an airtight container in a cool, dry place.